A Warwickshire inventor has come up with a nifty idea, which is saving drivers thousands of pounds in fines. 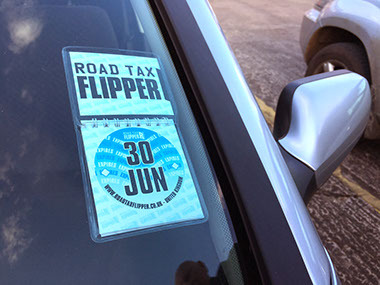 The Road Tax Flipper is a replacement for the (now redundant) road tax disc. The flipper fits in the windscreen of your car much like the tax disk did, but serves as an instant reminder as to when your car tax and MOT expire! SOUTHAM, England - Oct. 4, 2016 - PRLog -- Most drivers have relied on their tax discs and tax renewal date being highly visible in their car windscreens. In October 2014 the paper tax discs were abolished and the comforting visible reminders disappeared. As a result, more people have been hit by fines and had their vehicles clamped for failing to renew their road tax than ever before. Clamping alone has risen by nearly 60% since the new rules came into force. These kinds of problems are ones no driver wants to have to deal with. Thanks to a brand new and innovative product, drivers wanting to remember their renewal date have a handy solution. The Road Tax Flipper reminds you or your company to renew your vehicle road tax before the deadline passes. It has 13 flippable pages, and it couldn't be easier to use. It comes with a bespoke self-adhesive windscreen holder and the product provides a familiar tax disc-style appearance for drivers. Once it's in place, it becomes almost impossible to forget what day you need to renew your vehicle road tax on. The compact flip book covers every month of the year and can be removed from the holder and changed with ease. People no longer have to rely on a letter that comes in the post and prompts them of their vehicle road tax renewal date. Those letters are often unopened or get read, neglected and then forgotten about. It's not an ideal way for drivers to remember to renew their vehicle road tax. More people prefer seeing something tangible and clearly visible in order to be reminded. The brand new Road Tax Flipper offers that to drivers. The added benefit of having a card holder directly above the flip book adds further possibilities. This can be used for many different things, and it's particularly useful as a promotional card holder for commercial buyers. Any promotions can be displayed and advertised here. For drivers, it can be used for MOT or insurance reminders and parking tickets. Dealerships can display their information and contact details there as well. What the card holder space is used for is entirely up to the buyer. The Road Tax Flipper is printed and laminated on premium materials giving drivers years of service without a replacement being needed. This adds to the overall visual appeal of the product, which is suited to classic and contemporary cars alike. The style and design of the product will be familiar to anyone who was a driver prior to the abolition of tax discs. It also makes for a thoughtful gift idea for friends, family, colleagues or clients who love their cars. There's no doubt that everyone has enough to worry about without fines and vehicle clamps, so The Road Tax Flipper arrives at the ideal time.